Even today, police work is something of a man’s world. At the last count in 2007, only about 20 percent of sworn police officers in the United States were women [PDF], according to Bureau of Justice statistics. In the late 1800s and early 1900s, the idea of a woman in law enforcement—especially a woman doing the same dangerous work as their male colleagues and not sitting behind a desk—was unheard of. At least, it was until these women came along. From detectives to deputies to sworn police officers, these trailblazers paved the way for women to have careers in U.S. law enforcement. 1. KATE WARNE PROVES HERSELF AMONG THE PINKERTONS. 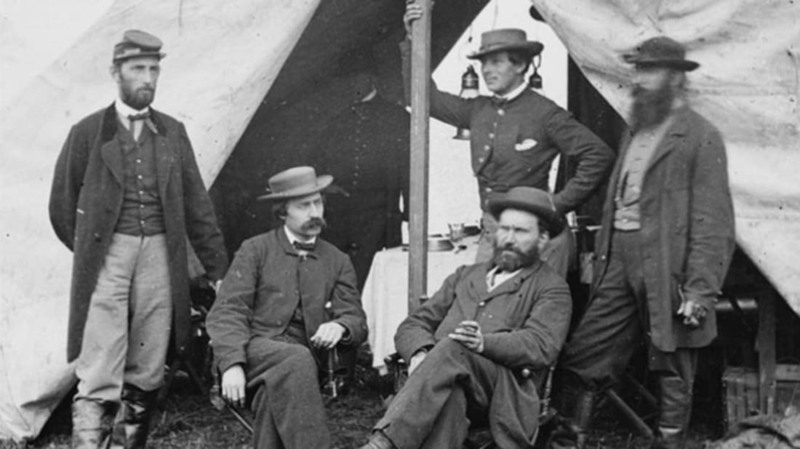 When Allan Pinkerton founded the Pinkerton National Detective Agency in 1850, he didn’t have any plans to turn it into an experiment in gender equality. Six years later, Kate Warne made him reconsider. Shortly after Pinkerton placed an ad for new detectives in a Chicago newspaper, Warne entered his office and asked for a position. To his surprise, she did not want to be a secretary, but a full detective. She argued that she could offer skills his male detectives didn’t have, arguing that women could be "most useful in worming out secrets in many places which would be impossible for a male detective," Pinkerton wrote in his records. After some convincing, Pinkerton hired Warne. She quickly proved he had made the right decision. Warne joined the investigation into some missing funds at the Adams Express Company. One Mr. Maroney was suspected of embezzling from the company. Warne befriended his wife, and learned information that helped recover almost the entire amount. It also led to Maroney’s conviction. Warne’s successes paved the way for a number of other female Pinkertons, both as private detectives and as Union spies during the Civil War. Pinkerton’s agency was hired by the Union Army to infiltrate Confederate society and help monitor troop movements and plots against the Union. It was in this second role that Warne helped to prevent an assassination attempt on President Abraham Lincoln. By this time, Warne was the superintendent of all of Pinkerton’s woman detectives, but he called on her especially to pose as a Southern lady in Baltimore and help learn details of the suspected plot. Warne won over the wives of several conspirators, gaining key information to uncover their scheme to kill Lincoln while he traveled by train and destroy a section of track as well. She then aided Pinkerton himself in smuggling the president secretly aboard a train so that he could pass through Baltimore undetected. Warne died of pneumonia in 1868, after 13 years as the head of Pinkerton’s woman detectives. She was only 38. Her remains were buried in the Pinkerton family plot. 2. MARIE OWENS EARNS A SERGEANT’S STAR. In 1889, as more women and children began to work in shops and factories throughout Chicago, the city appointed five women to serve as health officers to ensure that working conditions for these often exploited groups were reasonable. One of those women was Marie Owens, a widow with five children. It was her first real job outside the house, but she quickly gained a reputation for excellence and efficiency. She also soon earned herself a special assignment, looking after children under the age of 14 and enforcing Chicago’s long-neglected child labor law—earning the title of sergeant along the way. Owens rarely made arrests and did not go on patrol. Her rank and position were more of a formality to give her the authority to enforce the city’s labor laws than anything else. However, that did not mean that she was a figurehead or mascot. By 1901, she was the only woman officially on the Chicago police force. She had proven herself so vital to the force that they appointed her a patrolwoman to save her job when the health officers were phased out. “Mrs. Owens is qualified to make arrests and perform all the duties of a patrolman. In fact, she is a patrolman, gets the salary, has the rank and all,” her supervisor, Lt. Andrew Rohan, told the Chicago Tribune in 1904. However, she herself admitted that while she theoretically could make arrests, she did not; instead, she busied herself protecting the welfare of abused children and women laborers. She also cracked down on men who abandoned their families, leaving them in poverty. While the work she performed is closer to what a social worker would do today, her rank and employment by the Chicago Police Department made her the first woman police officer in the United States and perhaps the world. She retired after 32 years with the department at the age of 70, and died four years later in 1927. 3. CLAIRE HELENA FERGUSON, THE “GIRL SHERIFF OF UTAH,” LEADS THE WAY. It’s unclear who should claim the title of first female deputy in the United States, but Claire Helena Ferguson is certainly a contender, and was one of the most famous among her contemporaries. In 1897, she was just 21 years old when she received her commission in Salt Lake County, Utah. 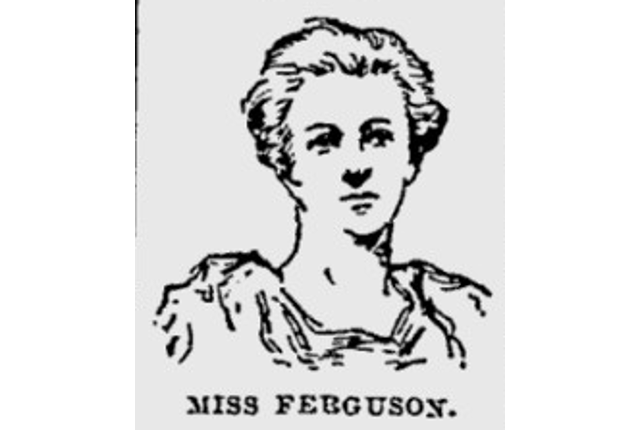 Ferguson’s duties appeared to be primarily focused on taking custody of female criminals and reprimanding child truants and vandals, along with serving as a stenographer in court cases. But she was reportedly the only woman to ever visit the Robber’s Roost, a Utah cattle thieves’ den—at least, as of 1899. She was also trained to use a gun like any other deputy, and there were reports she could be called in to carry out executions. Ferguson was adamant that she was no different than other women her age. She enjoyed courting and clothing, and she did “fancy work”—decorative needlework—when not on the job. In January 1898, she even appeared in a Salt Lake City stage play. She also wrote a number of columns about her exploits as a deputy sheriff for the New York Journal while visiting family back East, and the contents of those columns spread throughout the country. Claire Ferguson wasn’t the only trailblazer in her family. Ellen Ferguson, Claire’s mother, was a famous physician who was active in politics and served as a delegate to the 1896 Democratic National Convention. Claire Ferguson joined her mother in stumping for presidential candidate William Jennings Bryan that year. 4., 5., AND 6. MS. MARSHAL—PHOEBE COUZINS, MRS. F.M. MILLER, ADA CARNUTT, AND OTHERS BREAK GROUND. At the turn of the last century, several women quietly joined the U.S. Marshal Service as deputies throughout the West. They served federal warrants, escorted prisoners, and captured fugitives from the law. Among the first women to be appointed a deputy U.S. Marshal was Phoebe Couzins, who was appointed to the position in eastern Missouri when her father was named the U.S. Marshal there in 1884. Though her father appointed her to the position, she was well-suited for it. Couzins had a law degree and was one of the first woman lawyers in the nation. She had also spent years involved in politics, especially with the women’s suffrage movement. When John Couzins died in 1887, President Grover Cleveland asked Phoebe Couzins to step in temporarily. She served as his interim replacement for two months, making her the first woman U.S. Marshal. Though she left the service when she was replaced by a male permanent U.S. Marshal, Couzins went on to become a public speaker. She became more conservative in her older years, though, renouncing women’s suffrage and fighting against Prohibition. Another early deputy was Mrs. F.M. Miller in Paris, Texas, appointed in 1891. She rode with fellow deputy Ben Campbell in Indian Territory, based out of South McAlester, Texas. She was described as an “expert shot and a superb horsewoman, and brave to the verge of recklessness,” according to an article in the Fort Smith Elevator discovered by author Tom Rizzo. Meanwhile up in Oklahoma, a third deputy, Ada Carnutt, was actively making arrests, including boarding trains to do so. “Like all deputies of her era, she had to be extremely tough and ready to face a wide range of situations,” the U.S. Marshals Service wrote of Carnutt. Other early women deputies in the U.S. Marshals Service included Mrs. Jack Stringer of Seattle, Washington, Miss Nellie Burch of Kansas, and Misses Sadie Burche and Mamie Fossett, who worked together in Guthrie, Oklahoma. Not much is known about these women’s lives, but they took up badges during a time when few women did, especially in careers as demanding as the U.S. Marshals Service. 7. AND 8. ALICE STEBBINS WELLS AND GEORGIA ANN ROBINSON LOG FIRSTS FOR POLICEWOMEN. Alice Stebbins Wells wasn’t the first woman to hold the title of police officer in the United States, but she was the first to actually go on patrol and carry out the same duties as her male colleagues. Before she wore a badge, policewomen often had the same technical authority as their male counterparts, but in practice their duties were more like those of advocates or social workers. Wells wasn’t going to settle for that. In 1910, not long after Los Angeles passed a city ordinance allowing for the L.A. Police Department to hire policewomen, Wells applied for a position and was assigned to work as a juvenile officer. Her application must have come as no surprise to the department, since she’d helped advocate for the ordinance in the first place. While women had previously worked for the LAPD and other police agencies as prison matrons and in positions similar to social workers, the ordinance created the first positions at the department that granted women arrest powers and patrol responsibilities. Wells and her partner patrolled skating rinks, dance halls, picture shows, and other venues where young people might cause trouble—and young girls might be taken advantage of. She also had the pleasure of arresting “mashers,” men who made unwanted sexual advances toward women in public, or seemingly innocent offers to pay for a movie or ice cream with expectations of more from the young women they duped. Within two years, the department had hired two more patrolwomen and three police matrons. Wells advocated for more policewomen, visiting police departments in other cities, giving speeches around the state and country, and co-founding the International Policewomen’s Association in 1915 as well as the Women’s Peace Officers Association of California in 1928. She retired in 1940, after 30 years with the department; by then, about 40 women worked for the LAPD. In the meantime, one of the women Wells paved the way for blasted through another major barrier, becoming the first black woman to serve as a police officer in the United States. 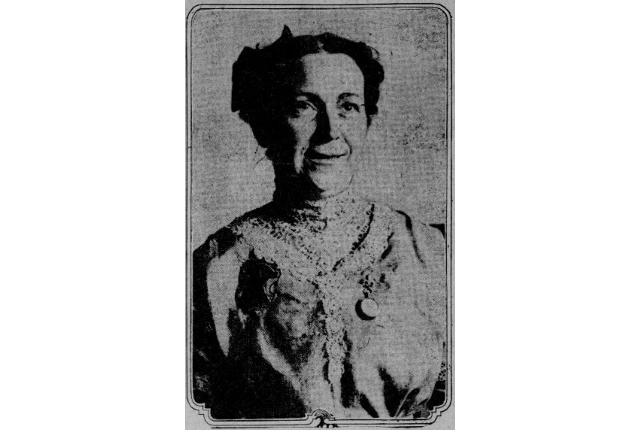 Georgia Ann Robinson was a 37-year-old volunteer with the LAPD when she was recruited to work as one of the department’s police matrons in 1916. The matrons served in the department’s jail, monitoring women who were suspected of various crimes. Robinson didn’t rest there, though; she was promoted to a full officer in 1919. Much like Wells, she was assigned to juvenile offenders, but she used that platform to work her way up to more traditional police work, including homicide cases. She also spent her free time working to fill the city’s needs, helping to found the Sojourner Truth Home for women in need of a shelter. In her work, she had observed that thousands of women and girls left their homes due to unsafe conditions. She worked as a police officer until 1928, when she was blinded while helping to break up a brawl between two women in the jail. She was pensioned on disability, but she was not content to live out the rest of her days in peace. She used her forced retirement to help desegregate Los Angeles schools and beaches, and continued to volunteer at the Sojourner Truth Home. "She was one of those individuals who had a command performance about her. She was no-nonsense and she did what she said and meant what she said,” Demetra Butler, Savannah Chatham Metro Chief of Staff, said in 2013. 9. CONSTANCE KOPP IS SECOND-IN-COMMAND TO TOP COP. Not long after women began making names for themselves as deputy sheriffs, they began looking toward the highest position in their departments: Sheriff. 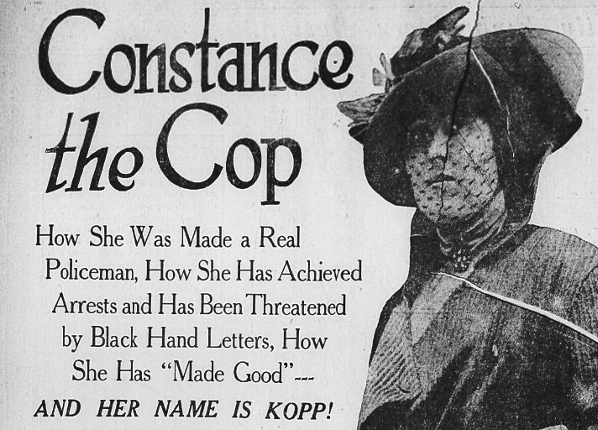 One woman pushing against the glass ceiling was Constance Kopp, or, as she was called by the newspapers, Constance the Cop. Kopp never served as sheriff, but she was invited to serve as undersheriff of Bergen County, New Jersey, second in command to Sheriff Robert Heath, after a fascinating real-life saga of lawsuits, vandalism, and threats of human trafficking. It all started when Henry Kaufman, a wealthy factory owner, crashed his car into the Kopp family buggy in July 1914. He refused to pay for the damages, and Constance Kopp, no shrinking violet, filed a lawsuit. The courts awarded her $50, which evidently provoked Kaufman’s ire. After he accosted her on the street, Kopp had him arrested. That’s when prowlers began roaming the Kopp homestead at night, breaking windows and sending threatening letters. One letter demanded $1000 from the Kopp sisters, and threatened to burn down their home if they didn’t pay. Another said they planned to kidnap Constance’s sister Fleurette and sell her into “white slavery” in Chicago. Kopp turned to Sheriff Heath for help, working with him on an undercover sting operation that unfortunately came up dry. Despite that failure, Kopp continued to work closely with Heath and his men to track down the writer of the letters (which involved hiring the services of a handwriting expert), as well as discovering the owner of a diamond ring left behind by a vandal. They ultimately secured Kaufman's conviction; he was forced to pay a thousand dollar fine and was warned of a prison sentence if he “annoyed” the Kopps again. Heath was so impressed by Kopp’s mettle that he took her on permanently after the case was over. Kopp quickly proved herself worthy of the title, helping to track down a German doctor who was a fugitive from the law and closing other cases, but she lost her job two years later when Heath lost re-election. Kopp was nearly forgotten until author Amy Stewart discovered her story basically by accident, uncovering Kopp’s fascinating life and turning it into two historical novels—so far. 10. SHE’S THE SHERIFF: EMMA DAUGHERTY BANISTER DONS A BADGE. Kopp rose to unprecedented heights for women, and her accomplishment offered a stepping stone for possibly the first woman to serve as county sheriff outright. That was Emma Daugherty Banister, who never wanted the job. In August 1918, Banister became the sheriff of Coleman County, Texas when her husband, the elected sheriff, died and county commissioners asked her to take his place. She was no law enforcement newbie, however; for nearly four years, she had been a sworn deputy in her husband’s department, though her duties primarily involved keeping the office supplied and cooking meals for prisoners. While Banister only served the remainder of her husband’s term, three months, she completed her added duties well and received praise from the county’s top officials. Newspapers portrayed her as a fearless sheriff with six-shooters at the ready, but her real work was primarily continuing the duties she’d fulfilled as office deputy, with the addition of directing deputies, updating records, and answering mail. Commissioners were impressed enough by her efficiency that they offered to place her name on the ballot when her husband’s term had been completed. That wasn’t Banister’s dream, though. Instead, she turned them down and returned to the family farm. It proved to be a smart move, as the discovery of oil on her family’s property allowed her to travel and invest in real estate later in life. Still, her short term in 1918 opened the door for other women to serve as their counties’ top cops, both by appointment and by election.